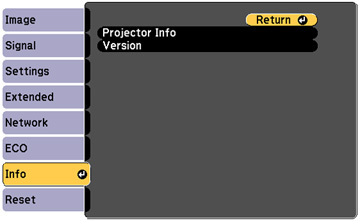 You can display information about the projector and input sources by viewing the Info menu. However, you cannot change any settings in the menu. Select Version to display the projector's firmware version. Select Projector Info to display the settings described below. Note: Available settings depend on the current input source. The lamp usage timer does not register any hours until you have used the lamp for at least 10 hours.